Anyone know what this clear thick piece of glass is? Found in Cape May NJ! I agree that this looks like the lip of an old Mason jar. I have also found these along Delaware Bayshore beaches. You may be aware that one of the old south jersey glassworks, c. 1800s, made these jars. I agree, looks like the top of an older, straight sided mason or Ball jar. Quite worn, the grooves are gone. 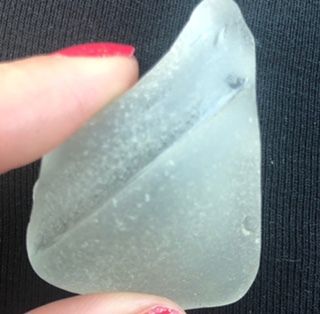 Curved pieces like this are nice focal center pieces for beach glass bracelets! Looks like it could be what Renee said Mason/canning jar. Nice find! I found similar on Plum Island last month! Hi...I think that might be part of the top of a mason jar!